A one year funding ban was a start, as investigations continue into the abortion industry giant being held to account for how Planned Parenthood conducts business, and just what kind of business the organization conducts. After years of deceptions perpetrated by Planned Parenthood with the cover of complicit media and high level politicians, it took ongoing congressional investigations to finally get the admission on the record, from the head of Planned Parenthood herself, that all claims to the contrary, they don’t do mammograms, a big selling point as to why they were allegedly necessary for delivering women’s health care. After that admission, Richards tried to turn the tables and make her best defense a robust offense in her testimony. “The latest smear campaign is based on efforts by our opponents to entrap our doctors and clinicians into breaking the law—and once again our opponents failed,” Richards said in testimony before the House Oversight and Government Reform Committee. Not this time. Anyone who has seen any of the undercover videos saw clearly that the words came out of the mouths of abortion clinic workers, or Planned Parenthood medical directors, and the attitude, tone and content of those conversations were caught on film. So was the cavalier way baby body parts were either talked about in terms of marketing and profitability, or handled in abortion clinics in graphic scenes showing dismembered human bodies in their earliest stages of growth before they were ‘terminated’ by abortion. Members of Congress wanted to see the videos for themselves, especially since they were held up by a legal battle after the first ten videos were released. U.S. District Judge Wiliam H. Orrick III, the same judge who issued a temporary restraining order on behalf of the National Abortion Federation in late July, said that CMP may release all videos and transcripts to the Congressional committee that had sought them. Meanwhile, some big media continue to try to provide Planned Parenthood cover. In vain, when keen journalists like Mollie Hemingway are watching. Which brings us to this unbelievably awful CNN report by Drew Griffin that aired this week. It also made me scream because of the errors, half-truths, and deceptions that it contained in its lengthy defense of the country’s largest abortion provider. It’s so tremendously bad that I don’t actually know where to begin. But she systematically goes through the seven biggest problems with that CNN report. About a day later, a major leak of hours of undercover videos got posted by an online news site, with yet more shocking revelations. Video footage seen here says it was obtained from a “National Abortion Foundation’s annual meeting in San Francisco, CA, on April 7th, 2014.” We do not know of a group called the National Abortion Foundation and believe this description is a typo of National Abortion Federation, which issued a letter in response to the apparent leak. Who was behind this revelation? WaPo claimed ‘a controversial blogger and an infamous hacker’ teamed up on the project, in an interesting turn of events and reporting on them. And the spin and blame and deflection continued. Meanwhile, quietly, another new video was released by the Center for Medical Progress. The eleventh video release from The Center for Medical Progress in the ongoing Planned Parenthood baby parts scandal shows the abortion doctor for Planned Parenthood in Austin, TX, Dr. Amna Dermish, describing a partial-birth abortion procedure to terminate living, late-term fetuses which she hopes will yield intact fetal heads for brain harvesting. Dr. Dermish admits she was trained by the Senior Director of Medical Services at Planned Parenthood Federation of America, Dr. Deborah Nucatola. 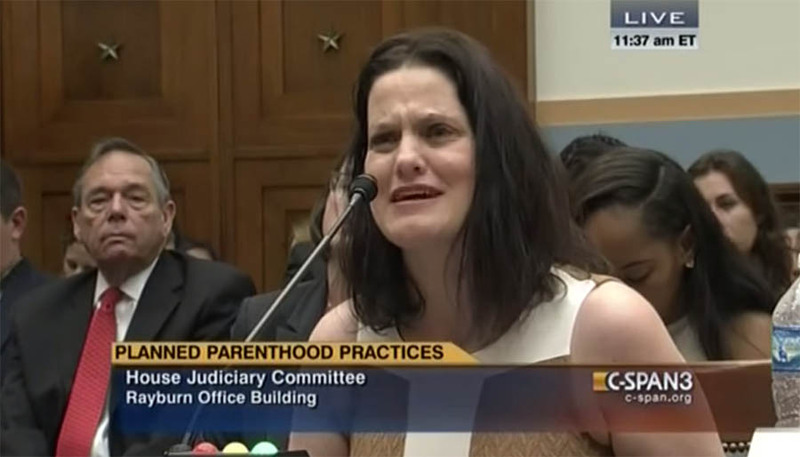 Nucatola described a partial-birth abortion technique to harvest fetal organs in the first Planned Parenthood video released July 14 by CMP. Which is illegal. And revolting and stunning, given the fact that “20-weekers’ are five month old babies, who are being negotiated for sale of their body parts.